On June 14, hundreds of employees, suppliers and local supporters of Johnson Welded Products (JWP) gathered with their families for a picnic celebrating the company’s 45th anniversary. 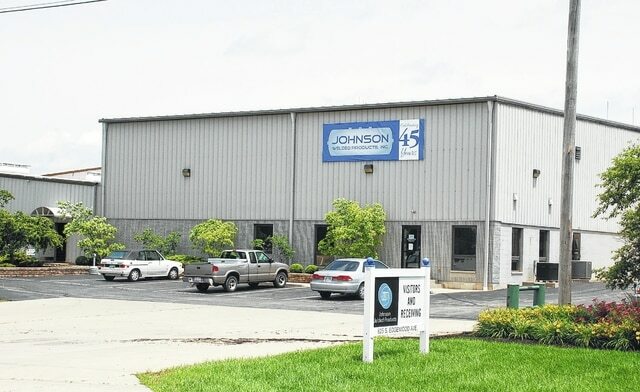 Founded in 1970 on the west end of Urbana, JWP employs 395 people and manufactures air reservoirs – tanks that hold the air used to actuate brakes on heavy vehicles. Customers include companies such as Peterbilt, Volvo, Kenworth, Freightliner, Navistar, Mack, Caterpillar and Bendix. Since 1985, JWP has held an annual summer picnic on company grounds at 625 S. Edgewood Ave. This year’s picnic featured a band, a catered barbecue and all-you-can-eat ice cream. For the kids, there were toys, rides and games. “Sunday (June 14) was dedicated to our greatest assets, our employees and suppliers,” said JWP President Lilli Ann Johnson, who has managed the company since the passing of her husband, Truman Johnson, in 1981. “We have experienced people who know how to make an air reservoir. Our employees are dedicated to being the best, and they are a hard-working work force. “The suppliers, who have been there for us over many years, have our sincere thanks and loyalty,” she added. When JWP opened in 1970, it operated from a 10,000-square-foot plant. Today, the facility spans 150,000 square feet.